One of the best things we did during our trip to Spain was rent a car and drive from Bilbao to San Sebastián. Seeing the beautiful, rugged, Basque coastline and the Bay of Biscay at our leisure, made for unforgettable day. Even though it was cloudy, we enjoyed visiting nine different towns: Bakio, Bermeo, Mundaka, Guernica, Lekeitio, Ondarroa, Mutriku, Zumaia and Getaria. 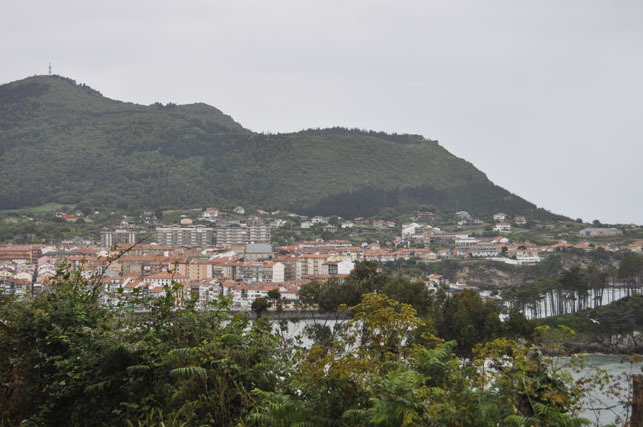 Mundaka is famous for its top surf. The Bay of Biscay is known for its rough waters that even experienced surfers would find challenging. Guernica (Basque: Gernika) is a small town with a somber history. On April 26, 1937, during the Spanish Civil War, Guernica was bombed by Hitler’s Condor Legion and Italy’s Legionary Air Force. The town was destroyed and 1,654 people died. 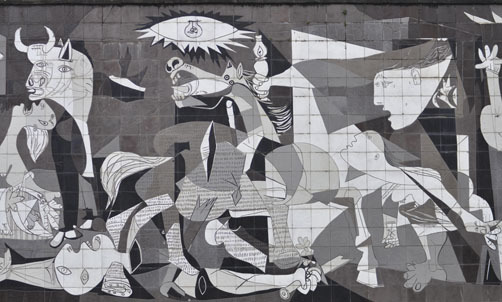 In response to this bombing, Pablo Picasso created Guernica—one of his most famous paintings. Guernica symbolizes the horrors of war. The original painting can be viewed in the Museo Reina Sofia in Madrid, but this ceramic tile replica, “Guernica” Gernikara, is available for all to see within the streets of this Basque town. Lekeitio is a small coastal village and fishing port. Its two beaches are a main attraction for visitors (however, it wasn’t much of a beach day for us). 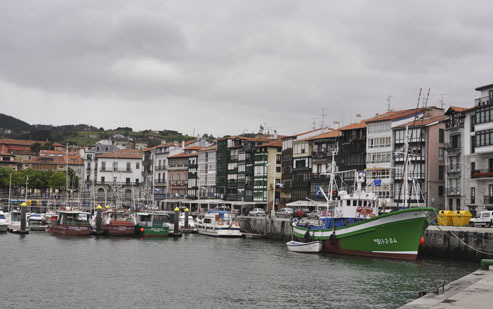 Ondarroa is another fishing port with the characteristic rugged, Basque coastline. As mentioned above, it was a memorable day. Driving past so much natural beauty was a real pleasure. This entry was posted in Spain and tagged Basque Coastline, Guernica. Bookmark the permalink. These are great pictures and it looks like you covered a lot of areas. I like that Picasso painting too. It was a great drive! The Picasso painting is a work of art. I’d love to see the original in Madrid.